Cell phone radiation exposure during pregnancy impacts fetal brain development and may cause hyperactivity, Yale School of Medicine researchers say. 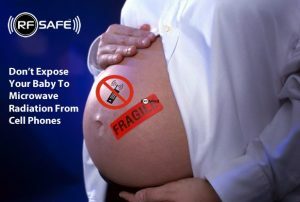 RF Safe offers soon to be moms the cell phone radiation protection that defenseless babies need from microwave radiation. RF Safe, the world’s premier provider of cell phone radiation protection accessories and informational safety data wants consumers to understand that there is no known safe dose standard of cell phone radiation for pregnant women, their developing babies, men who wish to become fathers, or for young children. All safety warnings for cellphones (e.g., keep 2.54 inches from the abdomen) are modeled after a full grown man who talks less than half an hour a day. The average toddler’s head weighs about half as much as the one for whom standards have been set. 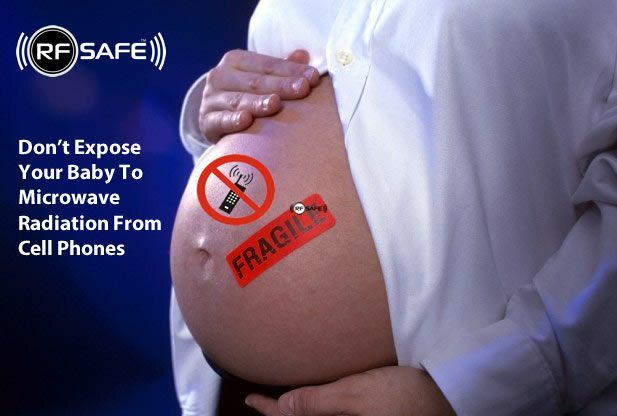 According to RF Safe there are numerous reasons that women who are pregnant, or who are planning for pregnancy, should be aware of why expecting mothers are at more risk to cell phone radiation dangers. in the March 15, 2012 issue of Scientific Reports http://news.yale.edu/2012/03/15/cell-phone-use-pregnancy-may-cause-behavioral-disorders-offspring. a Yale study says unborn mice exposed to cellphone radiation experienced changes in part of the brain responsible for hyperactivity. Fetuses’ developing brains are fragile and more vulnerable than adults, so it is prudent to keep the phone at a distance at all times when pregnant. The brain has very little bone protection allowing for greater absorption of radiation. RF Safe suggest a few simple things that can be done to greatly reduce cell phone radiation exposure. Don’t hold a cellphone directly up to your head. Use an RF Safe air tube headset or speakerphone to talk on the phone. Don’t allow children to play with or use a cellphone. Older children should use an RF Safe headset when talking or playing music on a smartphone. John Coates, RF Safe’s founder, claims a simple pouch designed to block cell phone radiation can eliminate the possibility of potentially hazardous radiation from reaching a baby”. When using the outer slot of an RF Safe Cell Phone Pocket Shield, it blocks microwave radiation from a cell phone by deflecting its radiation, by simply keeping the cell phone shielding between the cell phone and user creates a protective barrier that microwave radiation from cell phones can not penetrate. Pocket shields come in pink or black, and work perfectly for men and women to shield phone radiation when the phone is near the body – for instance in a pocket or purse. The study is the first of its kind to link cell phone radiation to developmental disorders in offspring, according to author Dr. Hugh S. Taylor, chief of the Division of Reproductive Endocrinology and Infertility at Yale Medical School. Since 1998 RF (Radio Frequency) Safe has been dedicated to evolving the wireless industries safety standards, by engaging in the business of design, testing, manufacture, and sale of safety technologies to mitigate harmful effects of cell phone radiation.